Apple MacBook Air Retina is a slim and light line of laptops. 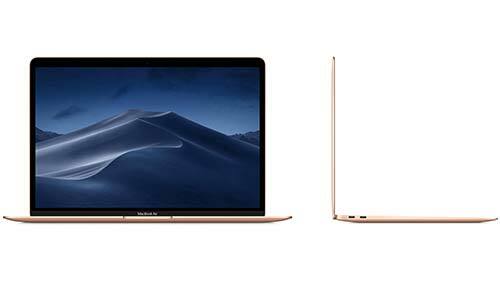 Combining up-to-date technology with excellent ergonomics and high resolution display, MacBook Air Retina is the natural choice for travellers and students. Specification combinations are subject to availability. For help choosing call 0800 527 867. Please choose the shipping location for this quote. Slim and light for all-day, everyday computing with new high resolution display. 1 year hardware warranty. ​ 3 year AppleCare Protection Plan optional. Charging, connecting to external displays and high performance peripherals, including ThunderBolt 3 external graphics processors (eGPUs) for performance gaming, video and content creation. DisplayPort output support for up to two 4K or one 5K displays at 60Hz using Thunderbolt 3 to DisplayPort cable. VGA, HDMI and Thunderbolt 2 adaptors available separately.